In this guide you can find detailed information on how to set preferences like brightness, contrast and saturation of your IP camera. To implement this example, you need to have OZEKI Camera SDK installed, and a reference to OzekiSDK.dll should be added to your Visual Studio project. 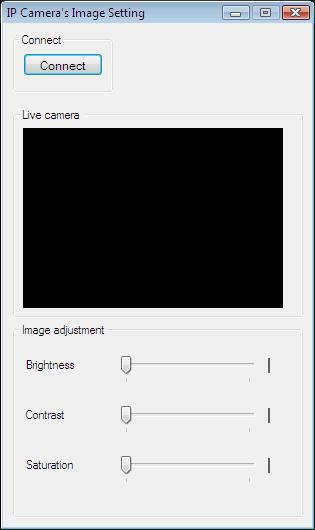 How to set the preferences (brightness, contrast, saturation) of an IP camera device using C#? These three new methods provide the additional functionality of this example. These methods are listening to their own scroll bar GUI elements and whenever the scroll bars are being modified the appropiate property of the camera image is also changing. These methods and event serve the functionality to load in and display on the GUI elements the IP camera's current preferences as soon as the streaming process has been started. This is a really short and elegant solution for C# cross-thread operations. The next example will demonstrate this technique as well. To establish the connection properly between your application and an IP camera you should apply the same code snippet what you have used in the example (How to connect to an IP camera device using C#?). Important: you should study this article in order to find out how to setup your WPF Application correctly. InvokeGUI() method serve the functionality to load in and display the GUI elements the IP camera's current preferences as soon as the streaming process has been started. This is a really short and elegant solution for C# cross-thread operations. The next example will demonstrate this technique as well. You should add the System.Drawing.dll and OzekiSDK.dll to the references of the solution. Why does the brightness/contrast/saturation change when I did not order it? It is possible that someone else is also using the camera. I can see the image but all the numbers are on 0 and I can move the scrollbars but nothing happens. In this case your camera does not support the modification of the brightness, contrast or saturation.